Abu `Ali Ahmad b. Muhammad b. Ya'qub Miskawayh (932-1030) is a brilliant intellectual and philosopher of 10th-century Buwayhid Baghdad. His effect on Islamic philosophy is mainly concerned with ethical issues. His book Tadhib al-akhlaq (Ethical Instruction) is considered as the first major Islamic work on philosophical ethics. Focusing on practical ethics, conduct, and refinement of character, it contains an original theory on the education of young boys. The following text was originally published as: "Miskawayh (A.H. 320-421/A.D. 932-1030)" by Dr Nadia Jamal al-Din in the series "Thinkers on Education" published by Prospects: the quarterly review of comparative education (Paris, UNESCO: International Bureau of Education), vol. 24, no. 1/2 1994, p. 131–52. ©UNESCO, 2000. Our republishing of the article relies on the authorisation embedded by the publisher according to which the document may be reproduced free of charge as long as acknowledgement is made of the source. The version we republish hereafter was edited and revised; we publish it with a slightly different title, new images and captions. Click here for the original version (in PDF format). 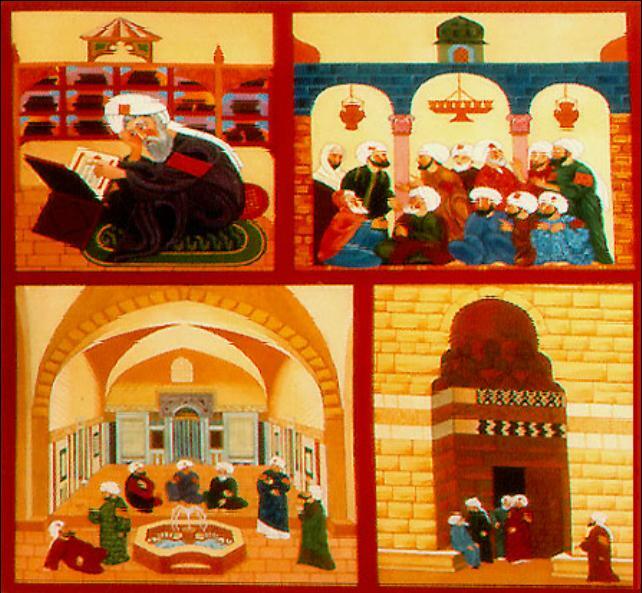 Figure 1: Scenes of teaching and learning in Islamic history (Source). The 4th century H (10th century CE) is regarded as one of the most brilliant periods of Islamic civilization; during this time the Muslims reached the peak of their intellectual maturity and progress in ideas. Indeed, a number of historians have seen it as the ‘Golden Age' of this outstanding civilization . It was in this century that Abu 'Ali Ahmad b. Muhammad b. Ya'qub Miskawayh (also known as Ibn Miskawayh) was born. It is established now that his name is actually Miskawayh, yet we find a number of his works, especially those not edited, but in fact attributed to him, where the name on the cover is Ibn Miskawayh. Those few works that are edited bear the correct name, Miskawayh; and that is how he is referred to by his contemporaries and the intellectuals and writers who worked with him . Miskawayh lived in the 4th century H and its scientific environment, and his very productive life extended for around 20 years into the 5th century, as is shown by the date of his death. So he spent the whole of his life within the period of the Abbasid empire, the rule of which extended from 132 to 656 H (750-1258 CE). This period of time is well known for the Muslims' concentration on translating the sciences from other languages, and it witnessed also a flourishing of writing in Arabic, once the translation process had yielded its results. Many Muslims excelled in the branches of learning known at that time. As a result of the many books translated into Arabic, the various compositions in all kinds of fields, and the spread of the use of paper, the caliphs turned their attention to the establishment of what were known as Dar al-`ilm or Dar al-hikma (House of learning, or house of wisdom) in Baghdad, Cairo, Cordoba, and in other countries of the Islamic world. These operated somewhat like public libraries, well provided for the needs of the general readers and specialists. Stationers' shops also appeared, for selling books or renting them out to readers; and there was increased competition among the caliphs, viziers, learned men, and others, to acquire books and to establish their own private libraries in their castles, and to gather people together for learned discussions on the content of these books, in what might resemble seminars or study circles today. Miskawayh himself worked as a librarian for the libraries of a number of the viziers (ministers) of the Buwayhids during the Abbasid rule. Maybe this work helped him to be in such evident contact with the culture of his age, so varied in its sources and its types, to be able to learn for himself, and to make such a thorough study of the branches of science and human knowledge. Though Miskawayh was born to Muslim parents in Rayy, in the land of Persia, he travelled to Baghdad, where he studied and worked, and was well known there for a time. Then he returned to live in Isfahan, in Persia, for a period of time; it was here that he died and was buried - according to the most reliable account - after a life of nearly a 100 years. Figure 2: Two recent editions of the Arabic text of Miskawayh's Tahdhib al-akhlaq: Dar al-kutub al-'ilmiya (Beirut, 1985) and Dar maktabat al-hayat (Beirut, 1989). Miskawayh is one of the outstanding personalities in the history of philosophical thought among the Muslims; so, as seems clear, his fame did not come about as a result of his involvement with teaching or with writing on education, in our modern terms, but his fame arose from his work in philosophy. Miskawayh was attracted to Greek philosophy, the books of which were available in a variety of Arabic translations because there were so many translators. However, he did not stop short at logic and theology, as did preceding Muslim philosophers such as al-Farabi (260-339/873-950), considered among Muslims as the Second Teacher after Aristotle, who was known to them as the First Teacher. Rather, he continued his path to deal with matters left aside by most of his predecessors or contemporaries among the philosophers. He differed from them in his concern for ethics more than most other studies of traditional philosophy at that time. Hence he was named by some the ‘Third Teacher', since he was considered the first ethical thinker among the Muslims . If Miskawayh was famous particularly in the field of ethics, yet like others of the best Muslim intellectuals he was very much attracted to the philosophy of the famous Greeks such as Plato and Aristotle and others, whose books, translated into Arabic, exerted their special fascination on those who worked with philosophy or were devoted to it . Perhaps the influence of Plato and Aristotle on Miskawayh is shown most clearly in his book Tahdhib al-akhlaq wa-tathir al-acraq (Refinement of character and purification of dispositions). He did not confine himself to the works of the great Greek philosophers, but studied others and referred to them also in his various works. These included Porphyrius, Pythagoras, Galen, Alexander of Aphrodisias, and Bryson. From this latter he took over most of what he wrote in connection with the education of young boys, although this man was not well known, as will be detailed later . In addition, Miskawayh is very clearly distinguished from others who worked in science and philosophy, within Islamic civilization, by the fact that he indicated clearly and distinctly the sources on which he drew; something which proves his scientific reliability, and also emphasizes his patent admiration for the branches of learning which he studied, well known and widespread throughout the Islamic community. So he did not hesitate to rewrite these in his own language, Arabic. Just as he was influenced by the Greek philosophers, so he was by his predecessors and contemporaries among the Muslim philosophers and scholars. Some of those he referred to distinctly in his writings, such as al-Kindi or al-Farabi, while with others he was content to mention their ideas only. Maybe one of the most important characteristics of Miskawayh also, emphasizing his great admiration for the Greek philosophy which had reached him, is that he did not aim for a reconciliation between religion and philosophy, as other previous Muslim philosophers had done. Nor did he attempt to combine them, as was done by the Brethren of Purity for example; but the opinions he set forth remained Greek in nature, and usually attributed to their original exponents . Miskawayh's scientific output is not restricted precisely to the field of philosophy and ethics, but he made a distinguished contribution to history; he also busied himself with chemistry, and was concerned with literature and other subjects. This emphasizes the multiple facets of his culture, making him a mirror for his age; for he is distinguished by the many sources of his culture and the encyclopedic nature of his writings . Miskawayh said himself in his book Tahdhib al-akhlaq, for example, that it is a book composed ‘for the lovers of philosophy in particular, and it is not for the general public' . Maybe this simply indicates how much he was influenced by the culture coming to the Islamic nation, and well known at his time. It may be, too, that it distanced him to some extent from the Islamic tendency, which did not recognize particularity in the field of learning, because the specialization of the élite in rational sciences was merely a Greek idea, as is well known. Figure 3: Front cover of The Refinement of Character, the English translation by Constantine Zurayk of Miskawayeh's Tahdhib al-akhlaq (The American University of Beirut, 1968). The book Tahdhib al-akhlaq is considered the most famous book of Miskawayh; so this is the work of which we shall examine the contents quite carefully, so as to base on it our presentation of Miskawayh's remarks on the education of young boys, only. For the work contains, in general, the majority of opinions which he introduced in this subject, although he did aim for a basis to acquaint the reader with the way to reach the supreme happiness. Maybe this tendency of his can be considered an effective translation, or a practical application, of the views he embraced, such as ‘seeing comes before action'  i.e. knowledge precedes action. For if the reader knows moral happiness, and is influenced by the contents of the book, all his actions will be fine, according to his interpretation. Hence it can be said that Miskawayh's book prepares the way for anyone who examines its contents to reach supreme happiness. So it is not possible to separate the learner's personality and character from the science he learns, and the aim and objective for which he is striving to learn it . The second maqala (section) of the seven in the book discusses character, humanity, and the method of training young men and boys. This is preceded in the first maqala by a discussion of the soul and its virtues. This all amounts to a general introduction, which needed to be presented because of the prevailing opinion in Miskawayh's day, where psychological studies took precedence over any other philosophical subject. This was like an obligatory introduction to every philosophical study. This ‘moral happiness' was the happiness enabling the human being to live happily, in accordance with the requirements of virtue. Thus it was a personal happiness which the human being could reach through intellectual effort, and striving to acquire the sciences which would make his thought inclusive of all the areas and all existent beings, and make him free himself from material things so as to reach the degree of wisdom whereby to grasp human perfection. The knowledgeable one who reaches this degree of supreme happiness is, in Miskawayh's opinion, called ‘the one completely happy', and the pleasure he attains, in this case, is an intellectual pleasure . Miskawayh mentions supreme happiness in the third maqala of Tahdhib al-akhlaq, and gives a detailed account of it in order to attract the attention of one who does not know it, so that he will seek it and will be seized by the desire to reach it .After this Miskawayh sets out to clarify the various kinds of happiness and its virtues, which the human being is able to approach, and to live happily in this world following the requirements of virtue, in his view. To realize this, he cites a number of conditions, some internal and some external. Among internal conditions, which influence the rational state of the human being and his moral direction towards good or bad, are conditions within his own body, in respect of his enjoyment of health and moderate temperament. Other conditions are external to the human body, and help him to rise above shortcomings, and to love good for others, to include friends, children, and wealth. For love of others, and affection towards them, can play a part in the progress and upward movement of all people; that is because these are a sphere for fulfilling the different virtues. In addition, there are conditions in the environment surrounding the human being, inasmuch as human society is one of the basic conditions of reaching supreme happiness. The human being can only fulfil his perfection if it is affirmed that he is a social being, as well as being rational. As a result of human beings living together with others, and being in contact with them, their experience is enriched and virtues are rooted in their soul by way of putting these virtues into practice. The importance of transactions with people, as Miskawayh says, refers to the fact that transactions lead to the appearance of virtues which only do so in company and in dealings and interaction with others, such as integrity, courage, and generosity. If the person did not live in this human milieu, these virtues would not be apparent, and the human being would become just like people frozen or dead. Miskawayh repeats in several places that it is for this reason the wise men said that man is civil by nature, meaning that he needs a city, containing many people, for his human happiness to be complete. This being so, it is easy to refer the idea back to its original source, since Aristotle presented it in his book the Nicomachean Ethics . 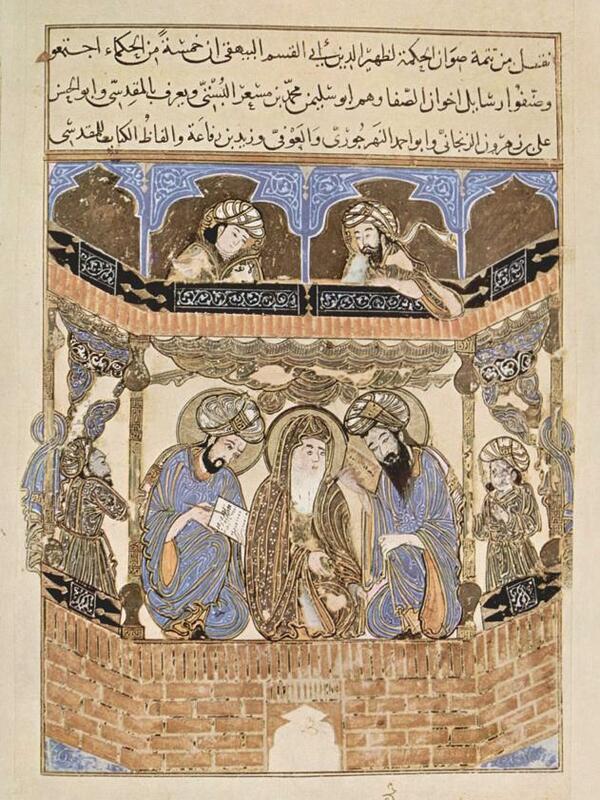 Figure 4: A scene of teaching from a manuscript of the Rasa'il Ikhwan al-Safa dating from 1287 CE (Süleymaniye Library, Istanbul) (Source). Besides all this, the basic conditions for reaching happiness are psychological conditions and factors; this is because training the soul, cleansing it, teaching it, making it profit from general and particular experiences, are centred on the human's will and his ability to raise his inclinations, so as to attain the degree of happiness appropriate for him. The sixth maqala, entitled ‘Medicine for souls', clarifies the importance for man to know his own defects. The seventh, entitled ‘Restoring health to the soul', clarifies the method of treating the illnesses of souls. In this maqala, Miskawayh does not distinguish between evil and illness; and the psychological evils or illnesses he lists are: rashness, cowardice, pride, boasting, frivolity, haughtiness, scorn, treachery, accepting injustice, and fear. Miskawayh is concerned with talking about the fear of death, also grief. For he considers that it is not difficult for the rational man who desires to free his soul from its pains and save it from its dangers to examine the illnesses and treat them so as to be set free from them. This must be by success from God and by the man's own personal striving; both are required, one completing the other . The above may serve to explain that, for Miskawayh, ethics are very closely bound up with the objective of the human being's education; for he stresses continually that it is not possible to distinguish between the learner's personality and character, on the one hand, and on the other the science he learns and the aim and objective for which he is striving to learn it. This is what he stresses very clearly in the introduction to his book, stating: Our aim in this book is that we should acquire for our souls a character, whereby we shall give rise to deeds which are all fine and good, yet will be easy for us, with no trouble nor hardship. This will be by craft and educational organization, and the way here is that we should firstly know our own souls, what they are, and what kind of thing they are, and for what reason they were created within us - I mean, their perfection and their aim - and what are their faculties and abilities, which, if we use them as is needful, will bring us to this high rank; and what are the things holding us back from it, and what will purify them so they prosper, and what will come upon them so that they fail . Ethics as a philosophical study is considered a practical philosophy, which strives to decide what should be; so examining this field of study does not lead to philosophical reflection as a final aim, but rather it is used in practical life. Maybe Miskawayh himself emphasizes this in his looking at philosophy and its divisions, for he sees that it is divided into two parts: a theoretical part and a practical part, each completing the other . It should be pointed out that when Miskawayh set out to talk of the training of young boys, he only approached this subject as his serious intellectual concern with the final end to which the human being is heading, or should be heading; and his moral philosophy, as a whole, brings the human being to reach supreme happiness; for there is no paradise nor fire, no reward nor punishment, since he distinguishes between philosophy and religion. He considers that religion retains man in his state of childhood and boyhood, where the faculty of the intellect is weak, while philosophy and supreme happiness remain for the human being's youth and manhood, where his intellect is mature and he knows how to use it towards the highest virtues and most perfect aims . The foregoing clarifies, to a great extent, how Miskawayh remained one of the Muslim thinkers most devoted to Greek philosophy. For he distinguishes between reason and faith, or between philosophy and religion, since the supreme happiness is a human happiness, one which is neither imposed on man nor withheld from him by anything outside the scope of his will, and issuing from an intellect greater and stronger than his . Within this framework Miskawayh's discussion of the training of young men and boys is placed, and within this framework also his viewpoint must be understood and read, in what concerns the choice of this age-group rather than another to talk about, and to present some opinions and viewpoints on the matter of their training. Figure 5: Laila and Majnun at school, a painting by Bihzad painted in 1494 in Heart, kept now in the British Museum in London. The painting illustrates a scene of a school with few boys and girls studying and learning from their teacher (Source). In his writings Miskawayh did not use the word ‘education' (tarbiya) since it was not a word widely used in his day and his milieu with the technical meaning it has today. It may also be well known that the word ‘education' was only quite recently used in modern European languages with the meaning now intended. The tendency here has been to use the very same word which Miskawayh used in his writings, ‘training' (ta'dib) so as not to impose on it more than was actually said, and in order to present his thoughts in connection with this important human process without encroaching on his rights . The opinion here is that reading the text in accordance with the language of his age, and the meanings it carries which the writer himself intended to express, is more precise and closer to scientific integrity. It is also useful to point out that the word ‘teaching' (ta'lim) was the word in widest circulation and most used in Islamic civilization to express what we mean today by the word ‘education' in many of its aspects. So the words ‘teaching' and ‘learning' (ta`allum) are also very close to words like ‘training' and ‘culture' (adab), where they express the meaning intended. Their use was widespread also in the 3rd and 4th centuries H, likewise the word ‘education'; now some consider that the Qur'an's use of them restricts them to what we today call the period of early childhood. This can be attested by reference to the Qur'anic words, for instance: ‘Say, Lord, have mercy on them, as they nurtured (rabba) me when young.' (17:24). This being so, education indicates a task, of an obligatory nature, which is undertaken by adults, particularly parents, for the young . If so, it can be said that the meaning of training primarily indicates the effort expended and directed by adults, to impart to the young desirable knowledge, morality, customs, and behaviour, to prepare them in the manner which makes them the acceptable human model within their society, i.e. the Muslim community of that time. Miskawayh aimed to discuss ‘refinement of character' and realizing this; he reflected, and based this on what was said by Aristotle in his book of Ethics, and in the book of Discourses also, that evil may be transmitted through training, even to the best; but not in all circumstances. For he sees that repeated warnings, and training, and people's adopting good virtuous policies, must have some sort of influence among the kinds of people; there are some who accept training and move swiftly towards virtue, and others who approach it, and move towards virtue slowly . Miskawayh ends his discussion of this opinion by explaining his view that every person can be changed; having done this, he indicates its influence on young men and boys, and the necessity to train them. Miskawayh does not confine himself to this view of Aristotle, but deduces it also from the reliable laws that are the way God deals with His creation . So Miskawayh held that what the boy has been accustomed to since youth will be of influence when he grows up; hence, he discussed the training of young boys, to which subject he devoted some pages of his book. This was one part of his thinking to realize his aim; consequently he made use of one of the books available and well known in his academic environment, and indicated it with exceptional confidence. Maybe this was a result of his trusting that what he did not write about his original aim, despite its importance, the Greek author, well known in his day, achieved the very same objective. So he borrowed from him, and thus in the second maqala of Tahdhib al-akhlaq there is the following heading: ‘Section on training young men and boys, the ideas taken from the book of Brusun'. Certain Orientalists came across some copies of this book, including a copy in the Egyptian National Library (Dar al-kutub al-misriyya), with the title ‘the book of Brisis on a man's management of his household (domestic economy)' (Kitab Brisis fi tadbir al-rajul li-manzilihi). However, the name was also written on an inside page of the book, as ‘Brusun': which the German Orientalist Paul Kraus corrected to Bryson . Whatever the opinion, this book, or manuscript, turned his attention to treating the method of domestic economy, through the discussion of four points: a. money; b. servants; c. women; d. children. Miskawayh took from this Greek author only what he said about children, which emphasizes what was already indicated, and it could almost be a literal transmission in many places; however, he sometimes added certain personal experiments and observations resulting from his own life experience . So it is useful to extract from this discussion some detail on: The aims of training young boys, according to Miskawayh. Figure 6: Teacher and Students by Musa Roosta, from the School of Tabriz, 17th century (Source). Maybe reflection on the title of his book, ‘Refinement of character', will produce a swift result, the import being that he trusted in the possibility of refining and purifying morals from the evils and wickedness attached to them. To this end we see him determining ‘that the art of character forming which is concerned with the betterment of the actions of the human being as human, this is the most excellent of the arts' . This trust is emphasized by the fact that in many places in his book he considers that his remarks about young boys are equally suitable for adults . It is not easy for the adult to change his character, with which he has grown up and been nurtured, except according to special conditions; unless indeed he himself grasps the extent to which his morals are corrupt, and forms the purpose of changing them. This sort of man it is hoped will abstain from his (evil) morals gradually and have recourse to the exemplary way by repentance and by keeping company with the good and the wise by the pursuit of philosophy . The reason behind his emphasis on the possibility of refining character and purifying souls, and freeing the self from evil habits and the like, stems from his opinion about people, which is that they are either good by nature or good by reason of the law and learning . Despite this, people differ in receptivity to training as regards eagerness for it, and their share of virtuous morality and fine dispositions . Hence, they are not all in one single rank as regards acceptance of virtuous morality; and if they differ, then this difference and disparity between them, which is beyond reckoning, merits the greatest concern with training and habituation of young men to approved actions. For neglect of training will cause every human being to remain in the condition he was in during childhood. Put in another way, Miskawayh considers that humanity is in constant need of adapting what he was brought up to and became accustomed to in childhood, and also what suits him naturally. If he does not do this, he falls into the place of the wretched, and his link with God is severed. 4. The preoccupation which arises from persistence in ugly deeds . For each one of these kinds of wretchedness or illnesses there is a treatment, with which the intelligent man can heal himself, if he tries to set himself free. So the manners spoken of by Miskawayh to train young men and boys can bring about benefits which revert to the person so trained. From another angle, training (or education) can be regarded as realizing specified aims, equally whether this be from the viewpoint of the one who assumes responsibility for it, or of the one subjected to it. To clarify this, we can present Miskawayh's own explanations, to extract from them the aims that can be directed to this business of training. Miskawayh says: These good manners, which are useful to boys, are likewise useful to older people; but they are more useful to the young, because they habituate them to the love of virtues and so they grow up accordingly. Then it is not hard for them to avoid evils, and later it is easy for them to follow all the prescriptions of wisdom and the regulations of the Law (shari'a) and Tradition (sunna). They become accustomed to keep themselves from the temptations of wicked pleasures; they restrain them from indulging in any of those pleasures or thinking too much about them. They make them desire the high rank of philosophy and promote them to the high matters described at the beginning of this work, such as seeking proximity to God the Most High, and being near to the angels. They will also be favoured in this world, with a pleasant life, and a fine reputation. Their enemies will be few, many will praise them and seek their friendship, especially the virtuous . From this text, which is repeated in various forms in the Tahdhib, we can deduce more than one aim for refining and training in Miskawayh's view. Indeed, it can be said that these aims include some which are temporal, for this earthly life, and some which are concerned with the time after death, with the eternal abode. Each is interconnected. That which is connected with training and avoidance of evils, and exercise of the soul, and following what the Law and Tradition define, and what wisdom prescribes: all this together leads to a goodly condition in this world, and a pleasant life, and a fine reputation; this is clarified in what actually happens, by way of having few enemies and many who praise him and seek his friendship and company. Thus, the practical aim attached to this earthly life, and resulting from the refinement of character, is bringing about the human being's adaptation to those around him: and this is exemplified in his conduct and his relationships with them. If he conforms with this, continues in it, and his knowledge becomes true and his action correct, ‘sufficiency lies not in the knowledge of virtues, but in acting with them', as Miskawayh continually determines . When the human being really acts in accordance with his knowledge, this demonstrates that he has reached the rank of the wise, or what can be expressed as the highest point of perfection in humanity . The human being's personal effort in seeking knowledge, and in his work and his conduct, leads him to be: ‘the happy, the perfect, seeking to come close to God the Most High, the loving, the obedient, and worthy of his friendship and love' . Since in Miskawayh's opinion, and as he says, also in Aristotle's, God is ‘the Wise, the Happy, the Perfect in wisdom; He is loved only by the happy and the wise, for a being is only happy with its like'. Hence, whoever approaches God and so earnestly seeks His favour, ‘God loves him and brings him close to Him, and he will be worthy of His friendship' . Whoever approaches God, and God brings him close, becomes in this way supremely happy, with a happiness that cannot be surpassed . This is the final aim of man's journey through life, the conclusion of his work and his service here; and his striving to purify his character, as Miskawayh prescribed, and presented to others who desired his knowledge, in the hope of being helped to realize it. By this definition of the final aim, there must perforce be the means enabling it to be reached; and consequently leading questions can be put, concerning the method of the upbringing of human beings in the way which helps them to fulfil this aim; and following on what Miskawayh said, the reply to this requires concern for the training and refining of souls; hence it is possible to begin by acquaintance with the souls of the young men and boys, and the factors influencing them, or what we could call in today's language ‘Human nature and the factors influencing its formation'. Humanity in general, Miskawayh considers, is the noblest of all existing beings on the earth which we inhabit . The soul of the boy is ready to receive virtue, because it is ‘simple, not yet impressed with any form, nor has it any opinion nor determination turning it from one thing to another' . Also because the soul of the boy is ready to accept training; so there must be concern for the boy, and he must be cared for, and not left to one who cannot do this training well or who does not have fine characteristics and excellent habits. Miskawayh remarks that these opinions are taken from Aristotle, but he very soon turns in another direction to present the boy's soul and its faculties in a picture that agrees with what Plato had earlier said in the Republic. This is that the soul, as has been said, is divided into three faculties, the appetitive, the irascible, and the rational. These faculties appear gradually, as the boy grows, until he reaches his perfection and is then called rational. And diffidence is the sign of this intelligence, and the indication that the boy has reached the stage of discernment, and consequently training, since diffidence means his fear of doing anything unseemly . Also Miskawayh presents the means or the way by which it is possible to recognize or deduce when the boy has reached this state: which is, that by careful scrutiny of the boy his intelligence can be deduced. This is that when the inquirer looks at him and finds he has lowered eyes, does not stare, and his face is not insolent, this is among the signs of his nobility and his fear of doing anything unseemly, and his preference for the good, and attaining reason. So his soul is ready for training, fit to be taken care of, and must not be neglected. Miskawayh's experience in this field, with his Greek culture, is his guide and the source of his ideas. The social environment in which the boy grows up plays an evident role in the formation of the boy's soul, or what can be called the business of bringing him up. That is because the boy's soul is simple, and as yet without imprint, and is ready and receptive to training, fit to be taken care of; when it finds itself in a bad social milieu, this leads to its being influenced by those around, and consequently its corruption: the soul accepts what it grows up with and is accustomed to, and hence comes the concern to watch over young men and boys in particular . The basic responsibility for this falls upon the parents . The aim in watching over the family here, and training the parents, is to reform the soul of the boy; for when he mixes with his peers and plays with those of his own age-group, he is influenced by them. In his early life, as Miskawayh remarks, he will be bad in his actions, relating what he has neither heard nor seen, passing on false tales. He may even stretch out his hand to other people's possessions, or may transmit stories which he hears, and may be overinquisitive. Because of all this, there must be a concern for training and refinement as long as he is a child, for children usually take more swiftly to learning and training. Their characters appear in them from the very earliest stage, and they cannot hide them nor dissimulate as an adult can who has developed to the point where he knows his own defects and so conceals them by carrying out actions which in fact are contrary to his nature. This being so, it is easy to recognize evil character among young men and boys and to work to set them free from it, and habituate them to virtuous morals since it is possible for them to receive these swiftly . Beginning with these views, Miskawayh presents the methods that are followed in training and refining the boy's soul. Some of these seem abstract, seeking to influence the boy's soul, and some are connected with his conduct and his external appearance. These can all be detailed as follows. Praise is considered one of the most important of these means and methods suggested; that is, praising the boy for the good things he does which are acceptable to the adults; and also adults who do good deeds should be praised in his presence. All this emphasizes fine actions, whether performed by him or by adults, and by those considered to be an example for him. Encouragement to rise above the desire for food and drink and fine clothing. Encouragement here is by commending abstinence from these things and contentment with only the small amount necessary. He should be trained to admire generous characteristics, such as preferring others over himself in matters of food and drink, and he should confine himself to what is moderate and seek it. He should be warned of punishment, and made to fear blame for any evil deed he may demonstrate. If intimidation is employed, this must be by degrees, for if the boy transgresses in any matter which has been mentioned to him, and made attractive to him, or he ceases to do this, then it is best, in this case, to pretend not to have noticed, especially if he himself realizes the error and tries to conceal it and hide it from others. If it is necessary to reproach the boy for what he has done, so that he will not revert to it, then this should be done in secret; because disclosing these matters might lead the boy to be impudent, and he would think little of hearing blame, and consequently indulging in detestable pleasures to which his nature incites him. These pleasures are numerous . After all these psychological methods, the educator can have recourse to physical punishment if the preceding methods are not successful, and if it is really needed . Figure 7: Painting atelier of the Ottoman Sultan dating from 1595-1603. The miniature shows the author, probably the court chronicler Talikizade, caligraphist and miniature painter, working on the Shahname for Mehmet III (ruled 1595-1603). Topkapi Saray Museum, Istanbul (Inv. 1609/74a) (Source). These rules of conduct are connected either with sensory pleasures such as food and drink, or with the external appearance such as clothes, or finding relaxation from the weariness of study. However, these also have their rules such as play and physical exercise, and other rules linked to his conduct and his relationships with others; these are now given in detail. In this case, the boy must understand the basic aim of taking food, that it is a necessity and is desired for the health of the body, not as a means of sensory pleasure; hence he looks on it as medicinal for the body, to remedy the pains of hunger and guard against illness. Since food is not desired for its own sake, nor for its sensory enjoyment, or that should be the case, Miskawayh presents a collection of advice which can be said to be more appropriate for the ascetic Sufi novice than for a boy in his prime, and at a fundamental stage in his growth. In Miskawayh's view, the educator is meant to make the boy despise the idea of food, and should reduce its amount and its variety; so he should restrict himself to one kind when he is eating, and should sometimes eat dry bread on its own. Miskawayh considers that if these manners are commendable for the poor, it is even better to have the rich seek them. Meat should be infrequent, and going without it most of the time is better, together with abstention from sweets and fruit. The main meal is best taken at supper, so that it will not lead him to sleep during the day, for this is not approved. Food has its manners which must be watched over, and here Miskawayh advises the boy not to hurry over it, and to chew it very well; not to let his glance dwell for long on the food and the people eating, and where they put their hands, and not to stain his hands or clothing. The boy must not drink during the meal, and must beware of wine and any kinds of intoxicating drinks, for these are harmful to both body and soul. Furthermore, the boy must avoid attending any drinking sessions, so that he will not hear the follies which go the rounds at such times, unless they are attended by well-bred, virtuous people, from whose conversation and knowledge he can profit. Here, it is noticeable that Miskawayh did not say that wine is something forbidden, as is clearly laid down in the Islamic religion; hence, in his view, the prohibition is not from the rulings of the Islamic religion as they are the exemplary view of how the virtuous man should be, and the morals to which the boy must be trained and habituated. Miskawayh explains that the boy must grow up in the way right and fitting for people of nobility and honour; so he should wear white clothing, and avoid coloured or patterned clothing, since that is more proper for women and slaves. This has to be repeated in the boy's ears many times, so that he may be brought up, or grow up, in this way. Also the boy is asked not to adorn himself with what women would wear, nor to wear a seal-ring except when this is needed, nor to wear his hair long. This counsel extends to not taking pride in his father's possessions, whether food or clothing or anything else. Love of gold and silver is a disaster, and the boy must be advised to avoid them and not to use them in any shape or form . It is a duty to care for the body, since it brings its benefits to the boy, and here there are rules of etiquette which he should learn and follow; so Miskawayh is concerned with physical exercise. Despite the importance of this exercise for the body, Miskawayh did not neglect also the psychological effect of play, and hence he puts forward some features that must be present. Miskawayh advises giving the boy the opportunity to play at certain times, although this play must be of a good kind, to let him relax from the weariness of learning and observing etiquette; however, there should be nothing in this play to cause the boy pain or distress . If play here is necessary for relaxing from the exertion of training, physical exercise is important to the body, since the boy must be accustomed to walk, to move, and to ride, so that he does not become lazy; this because the various kinds of exercise dispel dullness and awaken energy and purify the soul . In connection with this, too, Miskawayh warns against sleeping for too long; for this makes him lazy, dulls his mind, and deadens his thought; and he determines the boy must be prevented from sleeping at all during the day . Miskawayh then presents a group of the various manners with which the boy must be provided. These as a whole prescribe the features distinguishing what may be called the refined man or the virtuous man, those features that society in general accepts and which can be defined as follows. Figure 9: Laila and Majnun at School: Page from the Khamsa of Nizami (Quintet of Nizami), dated 835 H/1431–32 CE from Timurid Afghanistan (Herat), painted possibly by Mir Khalil. (Metropolitan Museum of Art in New York; ink, opaque watercolors, and gold on paper) (Source). The preceding may give a picture of the basic features of Miskawayh's educational ideas that he put forward in one of the most important of all his books; it contains also a selection of his words from The Book of Happiness (Kitab al-sa`ada). His words of ‘advice to the seeker of wisdom' or philosophy which were included in Yaqut's biographical dictionary of literary men (Mu`jam al-udaba') drew a picture of the philosopher of ethics as he imagined him. This is almost explained and repeated in his words in the Tahdhib . Perhaps it is also possible, from the books referred to and the previous swift overview of his opinions, to set out a clear picture of the Greek influence on the thinking of a Muslim philosopher who drew on the culture of the age he lived in and took from it what was best. He had the greatest admiration for, and confidence in, the famous Greek philosophers, those who still hold their place in human thought. This confirms the clarity of his vision and his ability to choose from among the kinds of culture reaching the Islamic community; indeed, it also confirms the ability of Islamic civilization to take up the sciences coming to it from previous civilizations, to make use of them, to work with them, and add to them. Maybe this is emphasized by Miskawayh's indication that he borrowed what he found suitable in the works of the Greek ‘Brusun', as he referred to him. Of all the Muslim philosophers and thinkers whose intellectual works have come down to us, he is the only one to have said this. Something which emphasizes and clarifies our view here is the fact that there are some who think that certain well-known Muslim philosophers, apart from Miskawayh, borrowed from this book of Greek origin, though they did not mention their source - such as Ibn Sina (370-428/980-1037) and al-Ghazali (450-505/1059-1111) . Further clarification can be found in the work of an Orientalist M. Plessner, who in the 1920s published an ‘Arabic' translation of a Greek text entitled Kitab Brusun fi tadbir al-rajul li-manzilihi (Book of Brusun on domestic economy) (Heidelberg 1928). He observed that ‘the Book of Policy attributed to Ibn Sina is no more than a summary of the book of Bryson' . When comparing the Book of Policy (Kitab al-Siyasa) published by Louis Cheikho, in a collection of ancient philosophical articles of some famous Arabic philosophers (maqalat falsafiyya qadima li-bacd mashahir falasafat al-`arab) (Beirut 1911), he found that the content is concerned with the theme that the human being is a civil animal needing to live in society for the sake of fulfilling his basic needs. He divides up man's policy for his needs or management of his affair into five sections: a man's conduct of himself, his directing his income and expenditure, his ruling his family (wife), his guidance for his children, his governing of his servants. What comes under these headings is in the Epistle of Policy, a precise summary of what is in Bryson'sbook already mentioned . This is what has been said by some, to explain Ibn Sina's borrowing from Bryson. Abu Hamid al-Ghazali may have done just the same, although he does not indicate that he borrowed from anyone. However, a reading of the section in The Revival of the Religious Sciences (Ihya' 'ulum al-din) on training boys, entitled ‘Explanation of the way in the exercise of boys when they are first growing, and how to train them and improve their character'  shows clearly the points of resemblance between what was said by both Ghazali and Miskawayh, borrowing from another source; which has led some to say that al-Ghazali copied from Miskawayh without indicating the fact . Despite this, and as it is now known that Miskawayh borrowed from and clearly defined his Greek source, then it may perhaps be said that the source of both was the same, except that it is the Greek heritage translated into Arabic in a variety of versions. In this case perhaps al-Ghazali was one who copied directly from the text of Bryson, well known before his time and perhaps also during it, and did not borrow from Miskawayh; or perhaps he read the Greek original, and also read Miskawayh, and took from them both; for not much real difference exists between the translation and the composition. Despite all this, the fact remains that both were influenced by an Arabic translation known as ‘the Book of Brusun (or Brisis) on domestic economy'; that each of them still kept his distinctive viewpoint and his aim in training young men and boys in particular, and the aspects of his philosophy as a whole. Maybe it can be said also that although al-Ghazali was influenced by this, yet his expression of the final aim of training young boys remained closer to the spirit of the Islamic religion than Miskawayh; that is because for al-Ghazali the actual content of education, or its material, was taken from the Qur'an and the Prophet's sunna . Perhaps it also needs to be pointed out that Miskawayh was content simply to talk about the training of boys, without giving any details concerning the content of this training or the educational material which should be learnt by the boy; likewise he did not refer to the teachers, nor their manners and culture, as did others whose aims were in fact to write about the educational process and things connected with it . If Miskawayh wove together his thinking from both religious and philosophical sources, or he did not hesitate to take over what the minds of wise men had concluded in the moral realm and met with the objectives of the Islamic shari`a - yet his being influenced by the new cultures was not entirely good. For what is particularly noticeable in everything Miskawayh said previously is that he spoke only about training young boys, to the exclusion of girls, and he did not direct any obvious care towards them nor to women in general. In this he was influenced by the source from which he drew, or the portion of the book that he uses, and did not add to it. In this case, it would seem Miskawayh was writing for an imaginary, non-existent society, one in which women had no place, and hence he restricted his discussion to boys, the men of tomorrow, and no more. Maybe it has been said also that he did acknowledge the existence of women in his society, yet the evil opinions widespread about them, and influenced by the new cultures, caused him not to give any concern to them. For the philosophers, or those who were influenced by the new philosophies, opposed the spirit of Islam and what was decreed by the Tradition (hadith) and sunna of the Prophet, in this point in particular, where they confined themselves to men in expressing their educational opinions, and kept women well outside their concerns in the sphere of teaching . If Miskawayh did distance himself from natural life on this point, yet the rules of conduct which he presents and the exercise desirable for training young boys did not show concern for this boy's existence in everyday life, and did not prepare him for customary practical human life, to the extent that it prepared him for a life closer to that of the military, harsh, tough, and ascetic. In addition to this, what he would acquire as a result of this endeavour would be much clearer when the soul freed itself from the body; for the reward is for later, when this life is finished, when the spirit will obtain closeness to the Perfectly Happy, as has already been mentioned. Although Miskawayh indicated society in a city, and its necessity for the human being, he did not refer to the various kinds of work with its necessity and importance for the permanence of this city and also for the human beings living in it. That is, he did not speak about preparing the boy for work, and his various roles as producer and consumer, one with a profession or craft or labour by which to provide for his future. By reference to his words about the necessity of linking learning with action, the action meant here seems to be human conduct in general, and not productive work from the economic angle as we understand it today. This also places him nearer the thought of the new culture, regarding its elevation of intellectual activity and leaving work to the lower orders in society, to servants and slaves. So he did not consider preparation for earthly life, from the angle of work and acquiring a livelihood, to be among the aims of the upbringing and training of young boys. Maybe this could be interpreted as saying he did acknowledge that his book was for the few, and not for the general public; therefore that he was presenting an education to prepare a learned, thinking élite, striving to purify the soul, with sufficient time and maybe also ampleness of life-style which permitted them that, for then the aim of training was all concentrated on benefit for the individual in the first place and not for the whole community. Although the responsibility of refining and purifying the soul is an individual one, where every human being is responsible for himself in the first place, and then to complete the virtues he can help others in following along the way - yet Miskawayh did not speak of acts of worship obligatory for mankind in Islam, for these are responsibilities which fall on the shoulders of the adult person. Nor did Miskawayh mention any one of the foundations of culture in the Islamic community, except for religion and the learning and sciences and so on, which are closely connected with it. Maybe he considered this among the matters which are completed at an early stage, which the individual can reach and practise without much assistance; or that they have their foundations to which the boy can be directed; then what he presents in his book is only concerned with particular matters known only to the privileged. This may be born out by the fact that Miskawayh's talking about training young boys was only one part of his ethical thinking, and was not one of his precisely intended aims. To sum up the foregoing, the basic aim of training and exercise and acquisition of knowledge, and working by it, is the refinement and purification of the soul: hence fulfilling its perfection in this world, then reaching its happiness, realized by proximity to the Perfectly Happy. So the basic, and final, aim of training is an ethical aim, although it speaks of closeness to God by way of seeking to resemble Him in the hope of proximity to Him, and acquiring absolute happiness by this proximity. This idea is taken mainly from Aristotle, following what Miskawayh says about happiness by closeness to the Perfectly Happy, and is not satisfaction of God and attaining the reward in His paradise which God the Most High promised to His servants who follow His commands and avoid what He prohibits. It is confirmed that ‘the Happy' is not one of the attributes of God the Most High in the Islamic view; so bringing the human soul to realize supreme happiness by closeness to the Perfectly Happy after being set free from the body, in its picture which Miskawayh presents, expresses only an ethical philosophical aim, rather than a religious aim. Hence, although Miskawayh lived in an Islamic cultural environment, he directed his intellect to Greek thought, and his aims for upbringing and training and refinement, or education in today's language, were an expression of the culture which he had borrowed from, not the culture in which he lived. Nevertheless, the basic credit here goes to the spirit predominant in the Islamic community, which could permit at least some of its thinkers to transmit, or be influenced by, cultures of other nations previous to itself, without impediment; and it confirms also the idea of the meeting of cultures and the cross-fertilization of world civilizations and their mutual influence, in an ongoing movement of human thought. The human being will always remain capable of producing knowledge, seeking to increase it, transmitting it to others, adding to it, renewing it; which means it merits continual care and attention, to teach it, and, following Miskawayh's example, to refine character and purify the dispositions. Miskawayh (Abu 'Ali Ahmad b. Muhammad), Tajarib al-umam, ed. H.F. Amedroz, Egypt, Matba'at sharikat altamaddun al-sina'iyya, 1915. Abu Hayyan al-Tawhidi and Miskawayh, al-Hawamil wa-l-shawamil published by Ahmad Amin in partnership, Cairo, Matba'at Lajnat al-ta'lif wa-l-tarjama wa-l-nashr, 1951. Miskawayh's advice to the seeker of wisdom, for example, we find published in the book of Yaqut al-Hamawi, the Dictionary of Learned Men (Mu'jam al-udaba') (more usually Ma'rifat al-udaba'), trans. & ed. Margoliouth, ii. 49 ff. Javidhan Khirad (Persian) (Eternal wisdom) The Library of Cairo University, on the margin of manuscript of Nuzhat al-arwah wa-raudat al-afrah of Shahrazuri, microfilm No. 23005. Nadia Jamal al-Din, Ma'a kitab tahdhib al-akhlaq wa-tathir al-a'raq, published in the book of Hassan Muhammad Hassan (jointly), Madaris al-tarbiya fi l-hadara al-Islamiyya (Schools of education in Islamic civilization), Cairo, Dar al-fikr al-'arabi, 1984, 268, 301. Ibn Miskawayh, Tahdhib al-akhlaq (Cultivation of Morals), ed. C. Zurayk (1966), American University of Beirut Centennial Publications, Beirut; trans. C. Zurayk (1968), The Refinement of Character, American University of Beirut, Beirut. (A summary of Ibn Miskawayh's ethical system; this work is also known as Taharat al-a'raq (Purity of Dispositions)). Arkoun, M. (1970), Contribution à l'Étude de l'humanisme arabe au IVe/Xe siècle: Miskawayh, philosophe et historien (320/325-421) = (932/936-1030) (Contribution to the Study of Arab Humanism in the 4th/10th Century: Miskawayh, Philosopher and Historian), Paris: Vrin; revised 2nd ed, 1982. (The standard exegesis of Ibn Miskawayh's contribution to philosophy and history). Leaman, O. (1996a), 'Ibn Miskawayh' in S.H. Nasr and O. Leaman (eds.) History of Islamic Philosophy, Routledge, London, pp. 252-7. (An account of the context within which Ibn Miskawayh worked and the influence of his views). Leaman, O. (1996c), 'Secular Friendship and Religious Devotion' in O. Leaman (ed.) Friendship East and West: Philosophical Perspectives, Curzon, Richmond. (account of Ibn Miskawayh's notion of friendship and a comparison with contrary views). <a "="" data-cke-saved-href="http://muslimheritage.com/topics/default.cfm?ArticleID=1070#section8" href="http://muslimheritage.com/topics/default.cfm?ArticleID=1070#section8&quot;" data-cke-saved-name="sec8" name="sec8" title="">Miskawayeh's books in arabic from Maktabat al-Mostafa al-iliktruniya (Al-Mostafa Electronic Library): Tahdhib al-akhlaq; Tajarib al-'umam; Tajarib al-umam wa ta'aqub al-himam. Miskawayh and al-Tawhidi, Al-Hawamil wa'l-Shawamil. Edited by A. Amin and A. Saqar. Cairo: Matba'a Lujna al-Ta'lif wa'l-Tarjama wa'l-Nashr, 1370/1951. Miskawayh, Al-Fawz al-Asghar. Edited by Tahir Efendi. Beirut, 1319/1900. Translated by J. W. Sweetman, Al-Fawz al-Asghar: The Shorter Theology of Ibn Miskawayh. In Islam and Christian Theology, 2 vols., 1945,1947. London: Lutterworth Press, vol. 1, Part One, pp. 93-185. Miskawayh, Jawidan Khirad. Edited by A. R. Badawi. Beirut: Dar al-Andalus, 1983. Miskawayh, Kitab al-Sa'ada. Edited by A. al-Tubiji. Cairo: al-Madrasa al-Sina'iyya al-Ilahiyya, 1335/1917. Miskawayh, Tajarib al-Umam. Edited by H. F. Amedroz and D. S. Margoliouth in The Eclipse of the `Abbasid Caliphate, 2 vols, 1914/1916. Cairo: Matba'at al-Tamaddun al-Sina'iyya. Translated by H.F. Amedroz and D.S. Margoliouth. 1920-1921. TheEclipse of the Abbasid Caliphate. Oxford: Blackwell. Vols. IV, V and VII. Miskawayh, Tahdhib al-Akhlaq. Edited by C.K. Zurayk. Beirut: American University of Beirut, 1966. Translated by C.K. Zurayk, The Refinement of Character. Beirut: American University of Beirut, 1968. Nadia Gamal-al-Din (Egypt) Professor in the principles of education, College of Education, ‘Ayn Shams University, Cairo. In 1987, she was awarded the State Prize for the Advancement of the Socail Sciences (Education). Her books on education among the Muslims include Falsafat al-tarbiya ‘Inda Ikhwan al-Safa' [Philosophy of Education in (the works of) the Brethren of Purity] (1983); Madaris al-tarbiya fi lhadara al-islamiyya [Schools of Education in Islamic Civilization] (co-author, 1984). She has also published papers in a number of adult education periodicals, with particular reference to illiteracy among village women. The most recent of these papers was published in Women and Literacy Development in the Third World, edited by Eve Malmquist (1992). See for instance: Adam Metz, Al-hadara al-islamiyya fi l-qarn al-rabi' al-hijri (Islamic civilization in the fourth century H) trans. Muhammad 'Abd al-Hadi Abu Rayda, Cairo, Lajnat al-ta'lif wa-l-tarjama wa-lnashr, 1957. See for instance Abu Hayyan al-Tawhidi, Al-Imta' wa-l-mu'anasa (delight and sociability), Beirut, Maktabat al-Hayat, n.d.; T.J. De Boer, Ta'rikh al-falsafa fi 'l-Islam (History of philosophy in Islam), trans. Muhammad 'Abd al-Hadi Abu Rayda, Cairo, 1938. 'Abd al-'Aziz 'Izzat, Ibn Miskawayh, falsafatuhu al-akhlaqiyya wa-masadiruha (Ibn Miskawayh: his ethical philosophy and its sources), Cairo, Maktaba wa-Matba'at Mustafa al-Babi al-Halabi, 1946, 8. For more detail on the life of Miskawayh, see pp. 77-123. For more detail on books translated from Greek in particular, and their translaters, see e.g. Ibn al-Nadim (Abu l-Faraj Muhammad b. Abi Ya'qub Ishaq, known as al-Warraq), Kitab al-Fihrist, ed. Rida Tajaddud, Tehran, 1971. For more detail, additional to the above, see: al-Qifti (Jamal al-Din Abu l-Mahasin 'Ali b. al-Qadi al-Ashraf Yusuf), Ikhbar al-'ulama' bi-akhbar al-hukama' (on wise men and philosophers), Beirut, Dar al-Athar li-l-taba'a wa-l-nashr wa-l-tawzi', n.d.
 'Abd al-'Aziz 'Izzat, Ibn Miskawayh, 349 ff. See more detail at the end (of this article), the section on Ibn Miskawayh's scientific works. For more detail on the special effect of the writings of this period on Islamic civilization, in addition to Adam Metz, see: Ahmad Amin, Zuhr al-Islam (Islam's noon-day), Cairo, Maktabat al-Nahda al-Misriyya, 1966 (4 parts). Abu 'Ali Ahmad b. Muhammad, known as Ibn Miskawayh, Tahdhib al-akhlaq, Cairo, Maktabat Muhammad 'Ali Subayh, 1959, 76. The opinion we think reliable is that he is Miskawayh, not ‘Ibn Miskawayh'; but this work is not edited, and the name on the cover is ‘Ibn Miskawayh'. So we need to point this out here, as it is given thus on the cover, in accordance with usual academic practice. For more detail on the various meanings and uses of this word, see: Nadia Jamal al-Din, in: Hassan Muhammad Hassan and Nadia Jamal al-Din, Madaris al-tarbiya fi 'l-hadara al-islamiyya (Schools of education in Islamic civilization), Cairo, Dar al-Fikr al-'arabi, 1984, 194-8. For more detail on this point in particular see: 'Abd al-Fath Jalal, Min usul al-tarbiya fi l-Islam (of the sources of education in Islam), Sars al-liyan (Sierra Leone) Matba'at al-markaz al-duwali li-l-ta'lim al-wazifi li-l-kibar fi l-'alam al-'arabi, 1977, 17 ff. For more detail, and for information on what Miskawayh took from the Greek philosopher Aristotle, and his books translated into Arabic, see: 'Izzat, Ibn Miskawayh, 366 ff. On the comparison with what Miskawayh mentioned, taken from the book of ‘Brusun', as he referred to his name, translated into Arabic, see ibid., 425 ff. This point will be treated in detail later. For more detail see ibid. Ibid., 75, 105, 125, 175. Ibid., 57; see also 77. Hisham Nashaba, al-Turath al-tarbawi al-islami fi khams makhtutat (The Islamic educational heritage in five manuscripts), Beirut, Dar al-'ilm li-l-malayin, 1988, 8. Ibid., 9. See also, 'Izzat, 367, 425, 430. There is one copy of the manuscript of ‘Brusun', in Dar al-kutub al-Misriyya (the Egyptian National Library), Taymur Pasha No. 290, Ethics, entitled ‘The book of Brusis on domestic economy'; also under the title, ‘from the words of the sage Brusun on domestic economy'; published by the Orientalist Paul Kraus, authenticating this, in the Journal of the College of Arts, Fu'ad I University (now Cairo University), Egypt, vol. 1, May 1937. 'Abd al-'Aziz 'Izzat gave many details in his book, q.v. Imam al-Ghazali, Ihya' 'ulum al-din (Revival of the Religious Sciences), foreword by Badawi Tabana, Egypt, Dar Ihya' al-kutub al-'arabiyya, n.d., iii. 69-72. Zaki Mubarak, al-Akhlaq 'inda al-Ghazali (Ghazali's Ethics), Cairo, Dar al-kitab al-'arabi li-l-tibaca wa-lnashr, 1968, 224 ff. For more detail, see: Muhammad Nabil Nawfal, Abu Hamid al-Ghazali wa-ara'uhu fi l-tarbiya wa-l-ta'lim (Abu Hamid al-Ghazali and his views on education), unpublished MA thesis, Cairo, Maktabat Kulliyat al-tarbiya, 'Ayn Shams University, 1967, 339. See, e.g., Ben Sahnun, Adab al-mu'allimin (Manners of teachers), and al-Qabisi (Abu l-Hasan 'Ali b. Khalaf), al-Risala al-mufassila li-ahwal al-muta'allimin wa-l-mu'allimin (Detailed epistle on the conditions of learners and teachers), both published in: Ahmad Fu'ad al-Ahwani, al-Tarbiya fi l-Islam (Education in Islam), Dar al-ma'arif al-misriyya, 1961. See, e.g., Nadia Jamal al-Din, Falsafat al-tarbiya 'inda Ikhwan al-Safa' (Philosophy of education in (the views of) the Brethren of Purity), Cairo, al-Markaz al-'arabi li-l-sahafa, 1983. For more details on the sources of this objective see 'Izzat, 368.